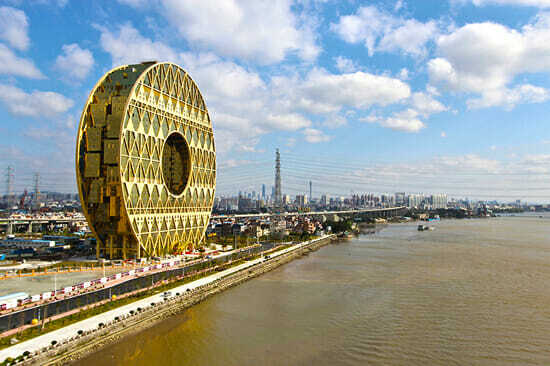 Guangzhou Circle by Joseph di Pasquale – Studios ArtSlope Pvt. Ltd. 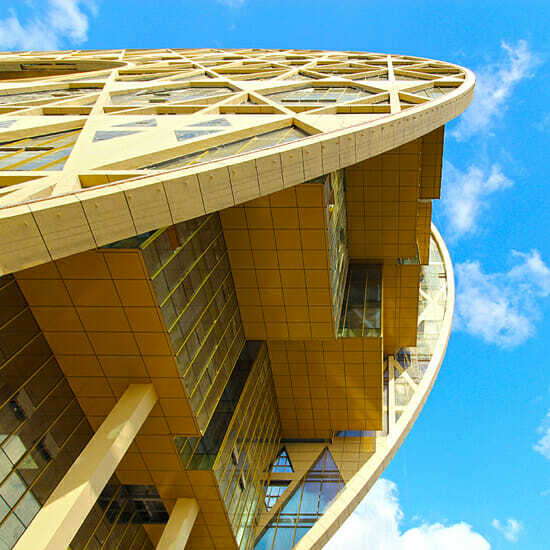 Located at the south west boundary of the city of Guangzhou in Guangdong province, China; the building is the new headquarters of the HongDa Xingye Group and the new home for the Guangdong Plastic Exchange also known as GDPE (world’s largest trading centre for raw plastic material). The building was designed by Italian architect Joseph di Pasqual and stands at a height of 138 meters and covers an area of 85,000 sq meters. The building has 33 storeys and stands at the bank of Pearl or Zhu Jiang River and is the tallest building of its shape. 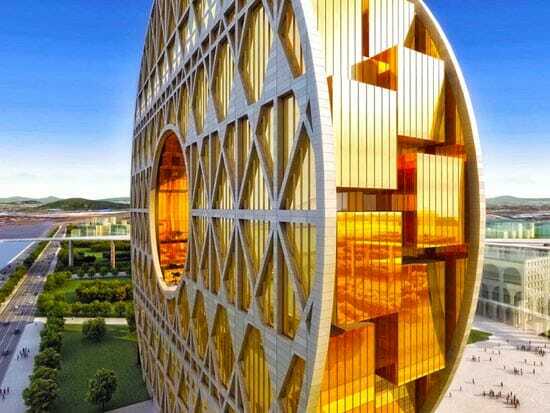 The clients that ordered the construction of the building are HongDa Xing Ye Group, Mr Zhou Yi Feng (CEO) and Mr Lu Xiao Qing (international relations) which cost about 70 million Dollars worth of investment. 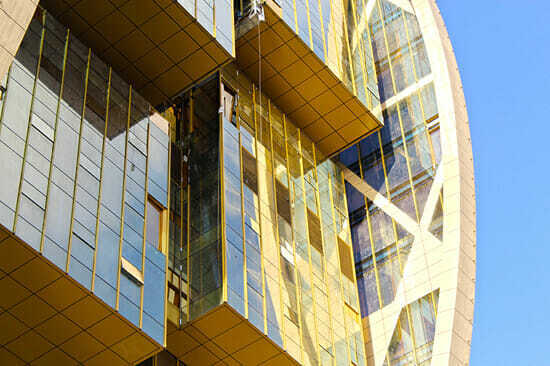 The building took around 3 years to construct and was recently inaugurated on the 16th of December 2013. 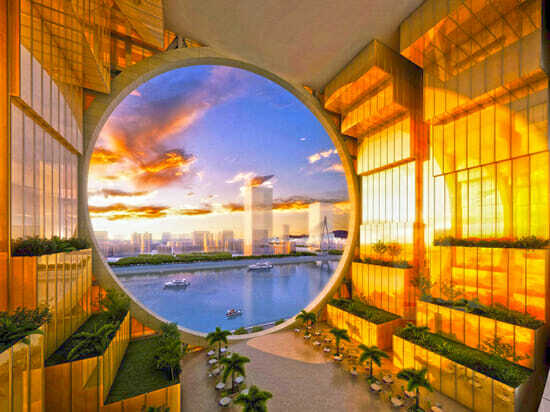 The design however is similar to another building in China, which is located in Shenyang but the central hole is kept hollow as compared to the glass enclosed hollow of the other building. 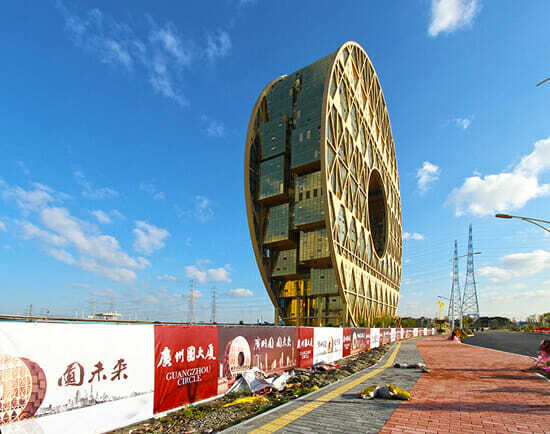 The shape of the building breaks the long term traditional design of a skyscraper and according to the designer, was inspired by the circular jade discs and Chinese coins, which was merged with the Italian Renaissance theme of “Quadratura del Cerchio” which literally translates to ‘Squaring the Circle’. 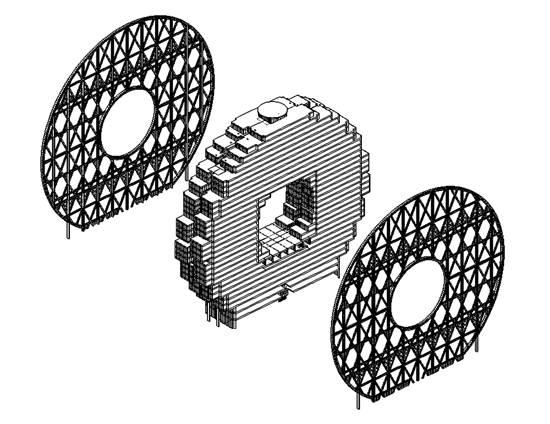 The 33 floors of the building were grouped in such a way that they create two rows of blocks which is clearly visible from the side of the building and were pushed out in an extreme manner using a 25 meter long cantilever. 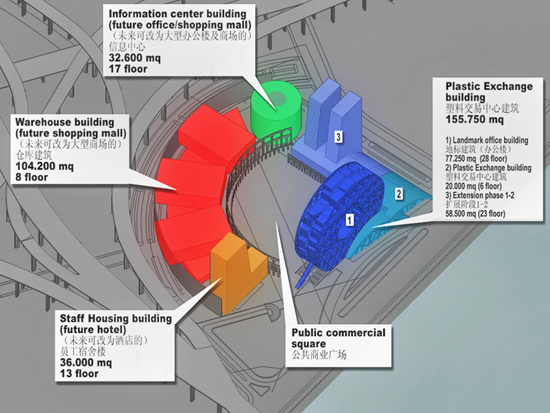 The heart of the entire building is the exchange hall which is located right below the central hole of the building. The two circular facades that sandwich the main building are responsible for giving the building its unique shape and work as scaffoldings that supports the suspended stories in this building. 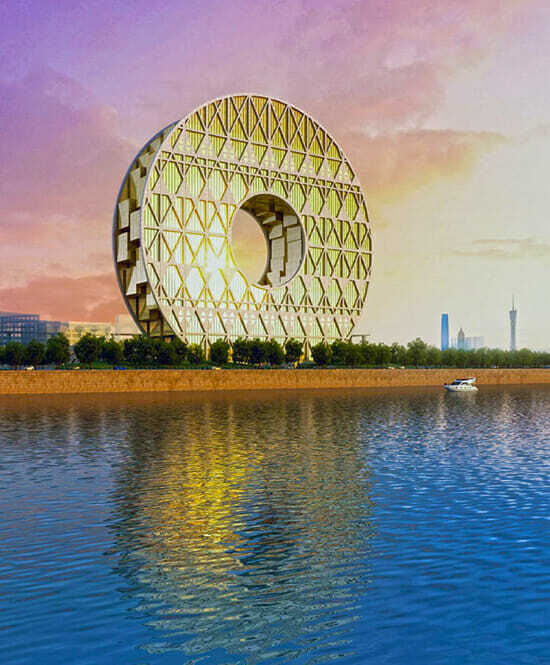 The initial concept was developed and tested at the Wind Gallery of Polytechnic, Milan in Italy and the final tests that included the structural calculations were done at the South China University of Technology (SCUT) in Guangzhou, China. 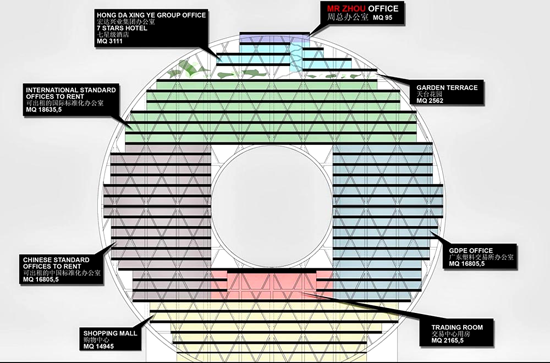 Most areas of the building aren’t open for general public; with the exception being the shopping mall located below the exchange room and is the first accessible area when you enter the building. Right above the shopping mall on the left wing of the circular building are the Chinese standard offices for rent. On the right wing is the GDPE or the Guangdong Plastic Exchange office. 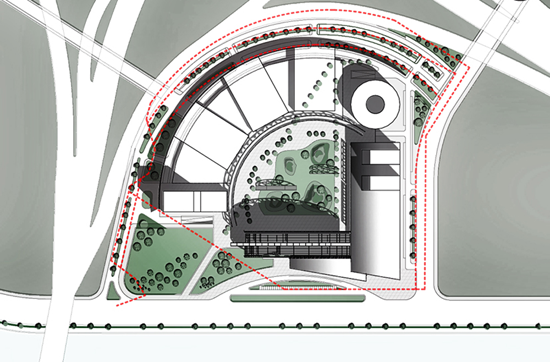 Located above the hollow space are the international Standards offices to rent. Followed by a garden terrace above which is a 7 star hotel and the office of the HongDa Xing ye group. The top floor of the building houses Mr. Zhou’s office. 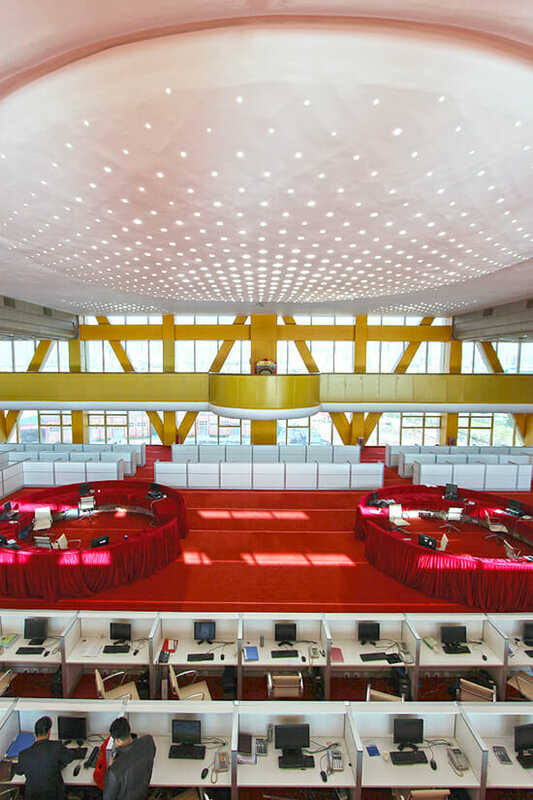 According to Joseph di Pasquale, the main idea behind the building’s unique shape was his search for a landmark which was based on the oriental mindset and perception of the Chinese people. He further incorporated Italian architectural techniques dated back in the renaissance era to make this modern marvel. The building also has relevance with the Chinese numerological tradition of Fengshui, as the building’s reflection in the Pearl River forms a perfect ‘8’ when it corresponds with the building. 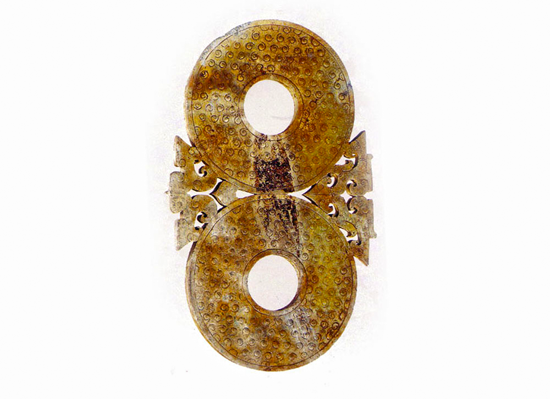 The number 8 is a symbol of infinity in Chinese culture and has a strong proprietary value. The significance of the number to the Chinese is clearly evident by looking at the date and time of the start of Beijing Olympics that is, 8:08 am of August (8), 8th 2008. 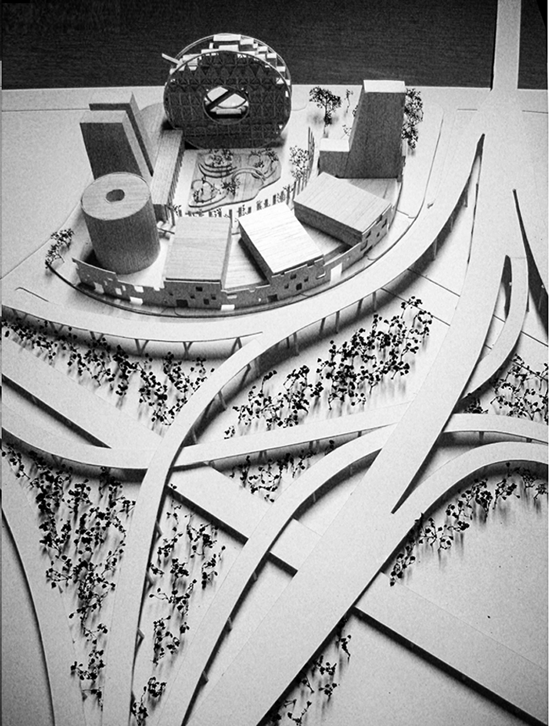 The design thus, can be termed as an ‘Architectural Ideogram’ that not only merges two different themes together but also makes it a cultural symbol for the Chinese.